Susan and I took the early ferry from Port Townsend to Coupeville on Whidbey Island, then on to the Skagit Valley Tulip Festival, and we managed to avoid some of the crowds. We had hoped for a sunny day as forecast, but as is the norm up here in the Pacific Northwest, the weather guys were wrong, and it was a gray, dreary, cold morning. But it didn't dampen our enthusiasm, as it has been several years since we went to see the flowers, and that day it was pouring! Whidbey Island is beautiful; very different from the Olympic Peninsula, with rolling hills and pastureland and lots of farms and old barns. 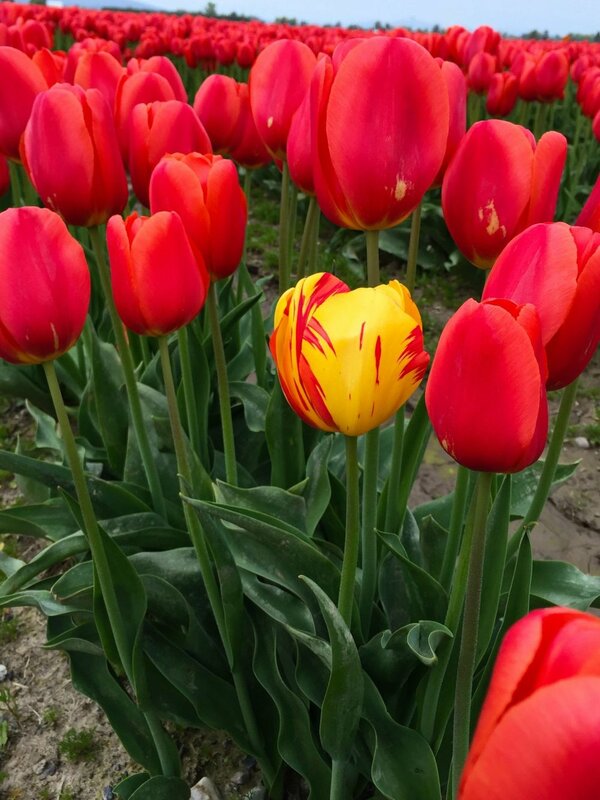 It's a couple of hours to get over to the Skagit Valley and we made out way to Tulip Town. The valley plants hundreds of acres of bulbs and the fields are easy to spot, the brilliant, jewel colors glowing against the drab browns and grays of the fallow and plowed fields. Tulip Town, one of the show gardens, was already busy, and even though we were early (before 10am) the parking lot was almost full and the tour buses were starting to arrive. It's expanded since last time, with a big indoor area with a food vendor, (I hesitate to call it a cafe or coffee house) and a couple of gift stores where I hoped to buy a tulip dish towel! The cold wind was making it's way through the building as we made our way out to the fields. As always, and despite the cold, the colors and the wide swaths of color are mind-blowing! The tulips were early this year, so even though it was the first part of the month, several areas were already over, but there were still acres and acres of color. It's also fun to see the kites that are set up in a field adjacent to the flower fields. The are staked down and the fanciful shapes and sizes soar in the steady breeze (wind). There were ones that twirled and others with l-o-n-g tails and Susan's favorite, the pterodactyls! All very colorful against the leaden sky. Trying to stay warm, we tried to keep moving but it was easy to get sidetracked into more and more pictures! Finally, we headed inside for a warm drink which worked more on our hands as we cupped them around the drinks, sipping to warm up! Our next stop was RoosenGaarde, the second show garden. Both show gardens are owned by the Roozen family, which owns the Washington Bulb Company, Inc,/RoozenGaarde. We pulled into a parking lot which ended up not being the main access but for us, it was perfect. There were very few people there and we enjoyed seeing the blooms without selfie sticks being thrust into our faces as we walked along! When we continued on to the main area, we were dismayed to see the masses and masses of people being herded down the pathways to the fields and decided that we would bypass this opportunity and headed intoLa Conner for lunch, a much more civilized idea, I thought! A pleasant outdoor patio (the sun was coming out) at a Thai restaurant, a glass of wine and we headed back to Coupeville and the ferry home.